You might already know that dentists use fluoride to strengthen teeth, but do you know what fluoride actually is? Fluoride is a naturally occurring mineral that is used in dentistry to strengthen your enamel. The mineral is also present in water, soil, plants, rocks, and even in the air. You might be surprised to find out your teeth already have a lot of fluoride in them. In fact, fluoride concentrates in growing bones and developing teeth of children, which helps to harden baby and adult teeth before they even emerge from the gum. Your tooth enamel, which is the white surface covering your teeth, protects your teeth against damage that can be caused by hard, sticky, or chewy foods. However, age, diet, and other factors can compromise this enamel layer. Fluoride is used to improve dental health because of the way it hardens the enamel. Your mouth contains both good and bad bacteria. Bacteria in your mouth break down sugar and carbohydrates from food; this process, known as demineralization, produces acid that can cause tooth decay. These acids can also strip calcium and phosphate from the tooth enamel. Weakened tooth enamel leaves your teeth vulnerable to the bacteria that cause cavities. Saliva that contains fluoride disrupts this attack by adding back calcium and phosphate as the fluid coats your teeth. Your teeth absorb these minerals from saliva to keep enamel strong. Once in your enamel, the fluoride teams up with calcium and phosphate to create fluorapatite, which makes the enamel on your teeth much stronger and more resistant to decay. In this way, fluoride helps to remineralize your tooth enamel, which means it can help restore the mineral balance of your enamel. But how do you get more fluoride into your tooth enamel? You can get fluoride to your teeth in two ways – by bathing your teeth in the mineral and by consuming it. Dentists can apply fluoride onto the surface of your teeth during cleanings to harden the enamel directly. Some dental products, such as toothpaste and mouthwashes, contain fluoride. If you live in an area where they fluoridate the water, your saliva will contain the mineral. Municipalities add fluoride to the water supply to reduce cavities in the general population. Water fluoridation is very cost-effective – research presented by the American Dental Association shows that it costs less to fluoridate a person’s water over his or her entire life than it does to fill even one single cavity. It is important to get enough fluoride to keep enamel strong and prevent tooth decay, but it can be dangerous in excess. Exposure to a high concentration of fluoride during childhood may cause a cosmetic problem, known as dental fluorosis, which causes harmless tiny white streaks or specks in tooth enamel. Excessive fluoride exposure can cause skeletal fluorosis, which results in bones that are hardened, less elastic and more prone to fractures. Other health issues, such as thyroid problems and neurological issues, have been linked to overexposure to fluoride. Fluoride is an essential part of complete dental care. 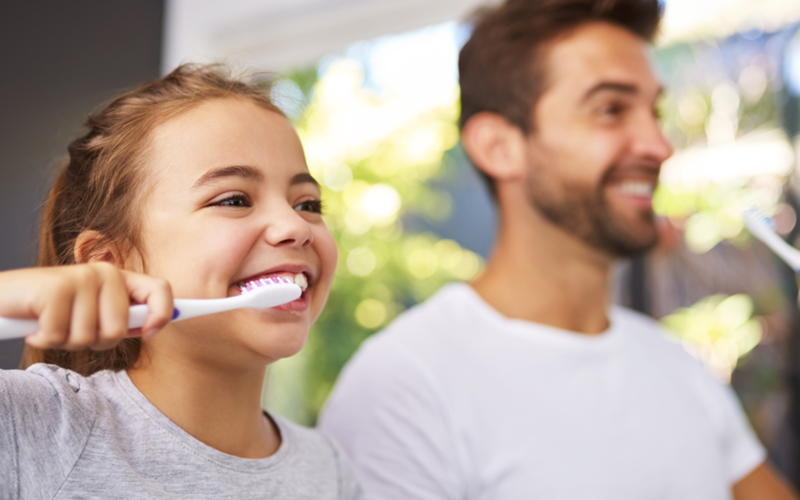 Whether you choose to use products at home that contain fluoride, get fluoride treatments at Triangle Dentistry, or drink water that is fluoridated, your teeth will thank you.